Livestreams of gameplay have become the next generation’s version of a television sitcom. Scott (Gunner Willis) grabbed a little piece of this sitcom pie, amassing a whopping two hundred adoring fans to watch him as he tackles the latest in online horror gaming. Indie games aren’t typically Scott’s choice but when an anonymous fan recommends the indie title “Livescream” for its interactive gameplay, Scott decides to livestream it for the world! Or at least a couple of hundred people viewing. As his followers begin to die off as he plays, Scott realizes just how real the interactive elements of this horror role playing game really is. It’d be easy to throw your controller down and hide but the rules of this game are “Play of Die”. “You have five lives, play carefully.” Online gaming just got real. Watching others stream themselves playing video games is something I’ll never understand the younger generation’s enjoyment of. I barely understand the enjoyment in playing those games yourself. With growing creativity being found in “found footage” films, recent years have seen the surfacing of livestream horror. While it’s not a completely overplayed concept, it is growing tired quick. This is my first livestream gaming horror movie. If you had showed me the poster art and described the plot, I never would have thought I would like this movie. I’m more surprised than anyone to say that I like it a lot. Gunnar Willis is basically a one man show as Scott Atkinson. While other actors are seen briefly as visuals, I don’t believe there’s another speaking part. This isn’t exactly an award worthy Tom Hanks Cast Away role as Scott sits in his gaming chair the entire film. Willis is however responsible for the intrigue of this Livescream video feed. With a cast of barely seen faces Gunnar Willis succeeds at making Scott’s followers lives and deaths matter. He sells the importance of his life or death gameplay and creates emotion interacting with the films other characters only through messenger. The second character in this Livescream is the gameplay. Scott works his way through nine gaming levels whose graphics look like everything from the original The Legend of Zelda, to Doom, all the way up to a cutting edge, Sega Dreamcast level of animation. The lack of graphics works in the indie gaming explanation of the script and are actually far superior to anything I expected. With limited real world settings Michelle Iannantuono succeeds at creating suspense in the virtual world. There’s actual intensity as the gaming character turns corners and runs from monsters. The varying levels with varying graphics are also enjoyable on a completely different level of not knowing what gaming world Scott will walk into on the next level. Don't even get me started on the final battle which somehow just works. My stream of Livescream looks like a film that’s made for the reported $1.5k budget. The cover, opening graphics and simple three cam setup of Scott, the game he’s playing and his chatroom quickly make you think this is a movie you won’t be able to finish five minutes of. 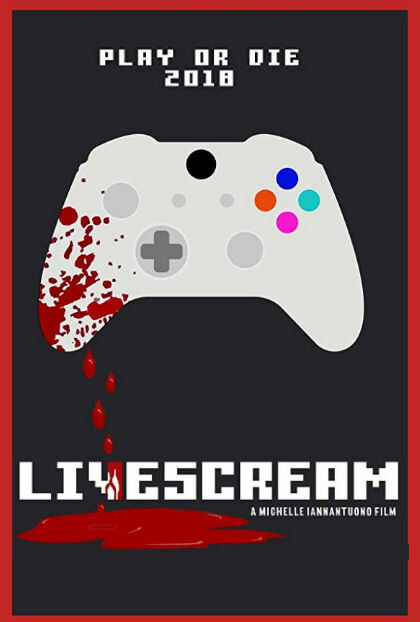 Livescream may be made with barely a budget to mention but in an hour runtime director Michelle Iannantuono pulls off something multi-million dollar theatrical blockbusters can’t do, she holds my attention from the opening scene until the game is over. Out of nothing she creates something that’s far more entertaining than I ever expected.